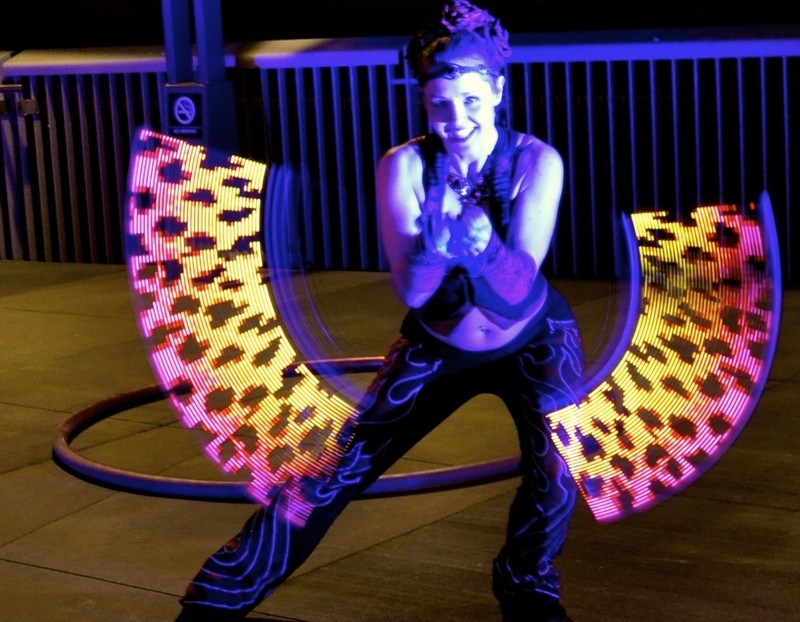 Professional LED Dancing — Ignis Pixel Poi, LED Cyr Wheels and the Backstage Experience « Adafruit Industries – Makers, hackers, artists, designers and engineers! 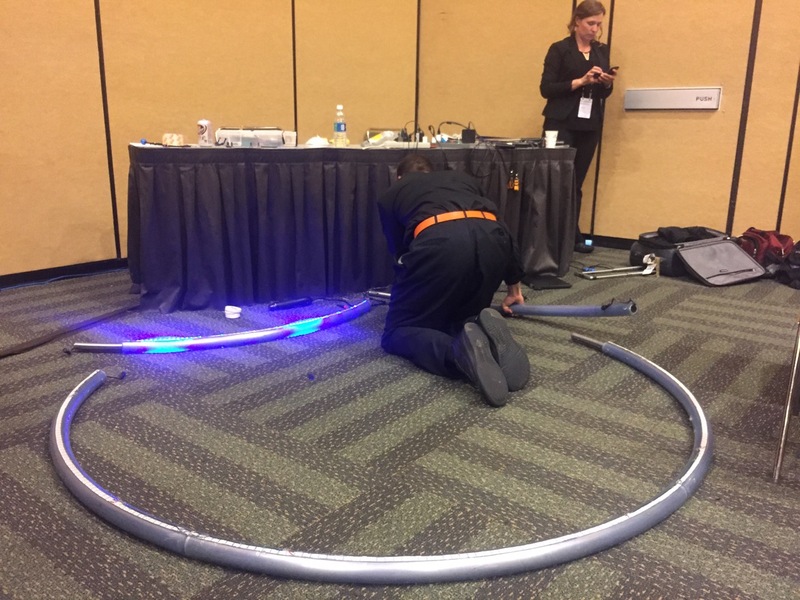 I have one of the best jobs in the world: I work as an LED light dancer at high tech events and corporate galas in the San Francisco Bay Area. Being a professional event performer in San Francisco and the Silicon Valley means I get to dress up and go to lots of fancy parties and show off my work. I also get to work with lots of other LED performers and event professionals who are crazy about things that light up. This week it was a tech conference after-party right in downtown SF. I got there early and enjoyed the incredible vendor meal spread and the view from Moscone West. You really get taken care of at these kind of gigs. Soon our backstage area was filled with performers: the 10 piece dance band, two strolling blackjack dealers (one of whom also moonlights as a Princess for my kid’s entertainment company), and one other poi dancer besides myself. There were also two LED Cyr wheel performers who’d made the drive up from LA for the gig. They’d been there already for hours, loading in their giant metal wheels, setting up their stage and warming up. Cyr wheel is very physically demanding, but these guys looked well up to it. I couldn’t wait to see their act. 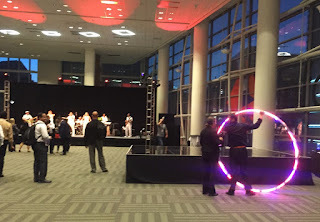 Our agent had secured Ignis Pixel poi for our show tonight, and I was really excited to get to try them out. 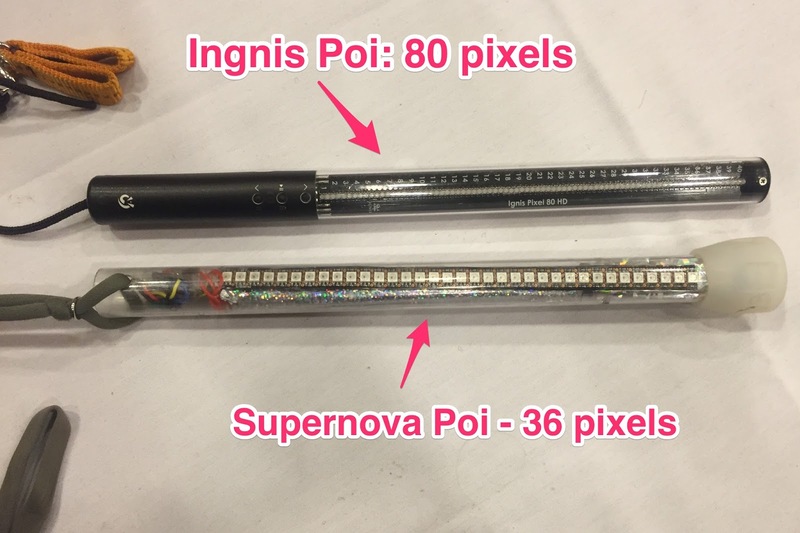 Ignis poi are the highest resolution Persistence of Vision (POV) poi available, and they run around $1800 for a set, so it’s not too surprising that this was my first encounter with them. I get to play with all the best toys. The dance band started up and I took the stage — a raised platform right in the middle of the room — and started rocking out to Living on a Prayer and Get Lucky. I love cheesy dance bands. Persistence of Vision poi draw images and write words in the air as you spin them, like light painting with LEDs. The poi were programmed to show our client’s logo, the name of the conference, and several different pithy words & phrases like “OUT PERFORM!” and “OUT MANEUVER!”. Yeah. One undeniable thing about POV is that it only works in one direction. If I’m spinning to the right, and you’re standing in front of me, everything is fine. If you’re standing behind me, any words or logos come out backwards. Now, they put my stage smack dab in the middle of the room with the audience on 4 sides. As I stood up there and danced, all the people behind me sort of squinted, tilted their heads quizzically, and then looked mystified. Well, at least they weren’t missing anything vitally important. And it did keep me amused. I spun the poi in the other direction for a while to be sure I’d confused everyone equally. From my vantage point I had a great view of the Cyr wheel stage. 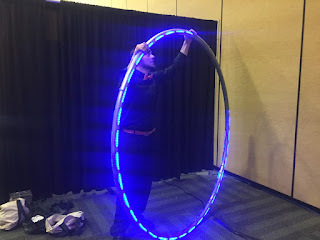 Cyr wheel is beautiful and astonishing, and LED Cyr wheel makes me want to jump up and down every time I see it, which, including this week, is exactly twice. These guys had two POV Cyr wheels handmade by a guy in LA and I couldn’t take my eyes off them. I was onstage so couldn’t get video, but here’s an example of one of these beautiful creations in action. After about 15 minutes, I glanced over and noticed that the LED Cyr wheel had gone dark. 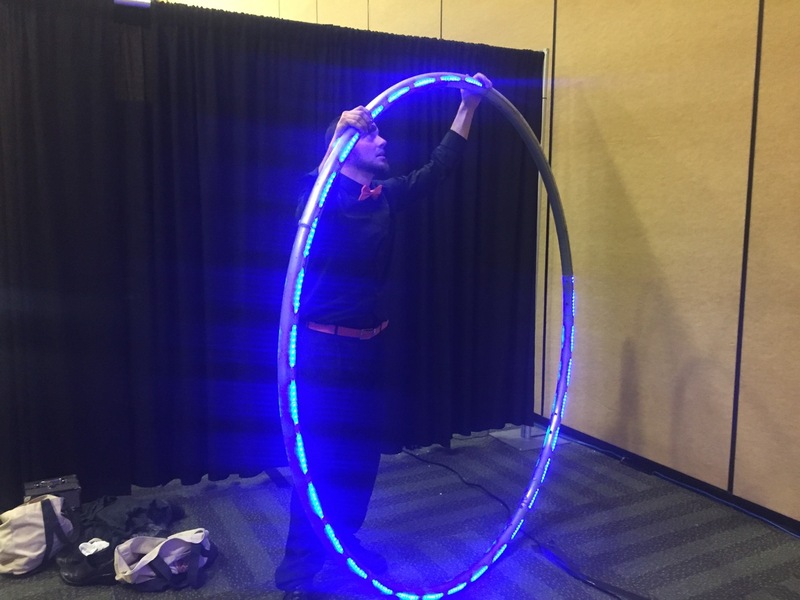 The dancer stopped, futzed with it for a second, and went offstage, to be replaced by the second LED Cyr wheel, which almost immediately blinked, fizzled… and went out. Man. I’ve been there. There is a reason fancy LED props are still so rare and expensive and it is this: LED props break right when you need them most. Most especially handmade props. Finding someone who is a skilled performer and also has the electronics chops and the sheer nerve to be able to fix them between sets at a high pressure gig — well, that’s a rare commodity. I go do another set. Take another break. Phil is still at it. I get an extra set added to my performance roster to help keep the stages full. Phil is on the phone with the Cyr wheel’s maker, asking for advice and trying not to panic. There are tools everywhere. One more set, a little Jessie’s Girl and Blurred Lines, and on my next break I come backstage and cheer. Phil’s got it working! All but one segment is lit, but that’s much, much better than nothing. It doesn’t look 100% professional, but it looks good. And really, a good Cyr wheel performer is fun to watch even without lights. Phil wipes his hands on his pants, stretches, and heads out to face an extra hour of performing tonight, to make up for the missed time. What a pro. I finish out the night to Proud Mary and reluctantly hand the fancy Ignis Poi back. Their images may have confused people, but they sure did not let me down. As I was leaving, I watched an exhausted Phil spin his Cyr wheel right off the stage. He earned his keep that night. I sure hope he gets paid. My main point of comparison is my own Supernova POV poi set, which I designed together with Phil Burgess for Adafruit.com. They have 36 pixels per side of high-density 144/m LEDs, and can hold around 90 images in memory. They have scripting capabilities, USB charging and they’re nice and sparkly. They cost around $100 to make. 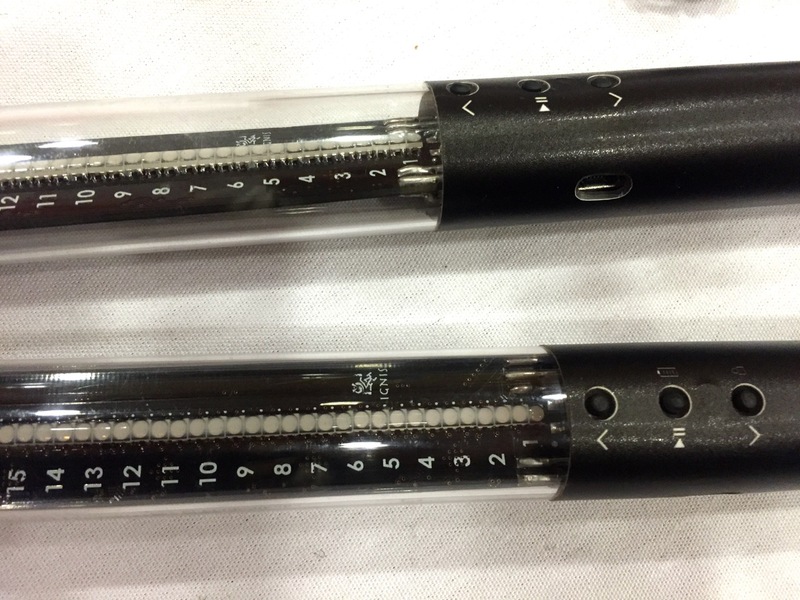 This is the smaller set of Ignis poi, the larger ones are twice as long. So what do you get for $1800? 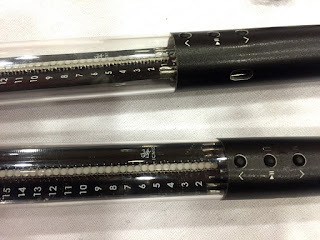 These poi were very well designed and thought out. The large set were about twice as long as my Supernova poi and with a lot more LED pixels — around 160 pixels per side. I’ve never seen pixels this dense before, anywhere. It makes for a really high-resolution image. The battery is located near the handle of the poi instead of at the bottom end. This means the heft and balance is really different from the Supernova poi since that’s where all the weight is. The Ignis poi weighed about the same, but in performance they are a little less tiring. I found them a little more difficult to control because of the weight distribution, but that might just be a practice issue. (These poi also ship with a “dummy” practice set of the same size and weight, which is a really great idea!). I like the control mechanism. Instead of a confusing and easy-to-lose remote control, the poi have 3 onboard buttons: an on/off button, and an up and a down button. 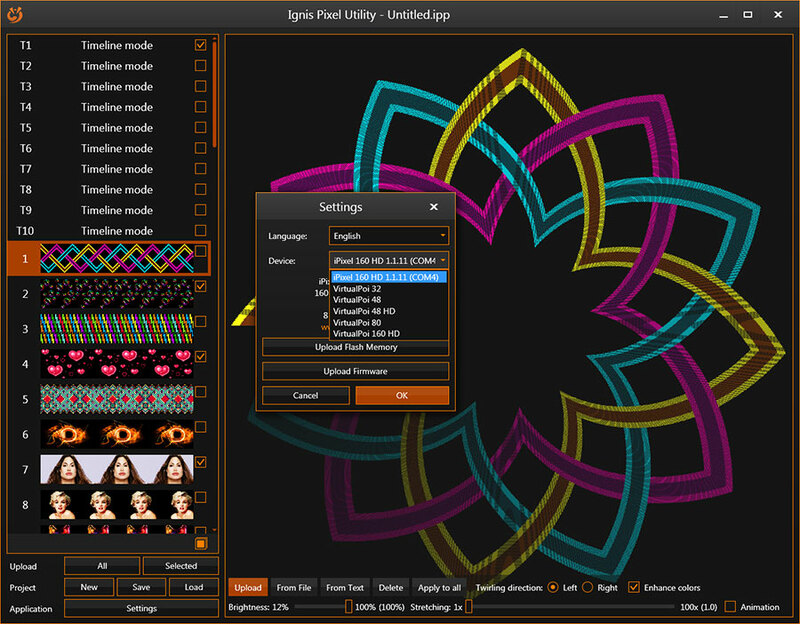 The software supports multiple scripts, so the performer can select between different programs right before going onstage. The LEDs on the poi changed color to indicate which program was currently running. Simple and efficient, and bonehead enough that even dancers can work them. They also had a battery life indicator — very useful when you suddenly have to make it through four sets instead of three because the Cyr wheel is out. And they have a “lock” function so that once a program has started, the performer can’t accidentally hit the button and reset it. The clocking was not great. By the end of my 15 minute set, the poi were about a half second out of sync with each other. 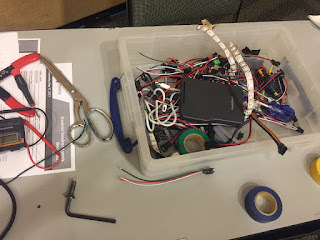 My Supernova poi run on Teensy 3.2 microcontrollers and stay in sync for hours. I believe Ignis offer an RF sync remote to make up for this, but we didn’t have one on site — I’d love to find out more about that. The biggest difference between these poi and the Supernova poi is the software. My Supernova poi require photoshop skills, a python script, lots of hands-on timing and an Arduino upload to create a performance. It’s not for the feint of heart. The Ignis poi come with their own WSIWYG editor, where you can drag images around, reorder them, and individually control their timing. It’s set up so anyone with basic computer skills can use it. I didn’t get the chance to explore it thoroughly, but our non-tech-savvy agent managed to update the program in 10 minutes between sets right at the event, and that’s something I’d never attempt with the Supernova poi. Lastly and perhaps most important from the performer’s point of view is robustness. 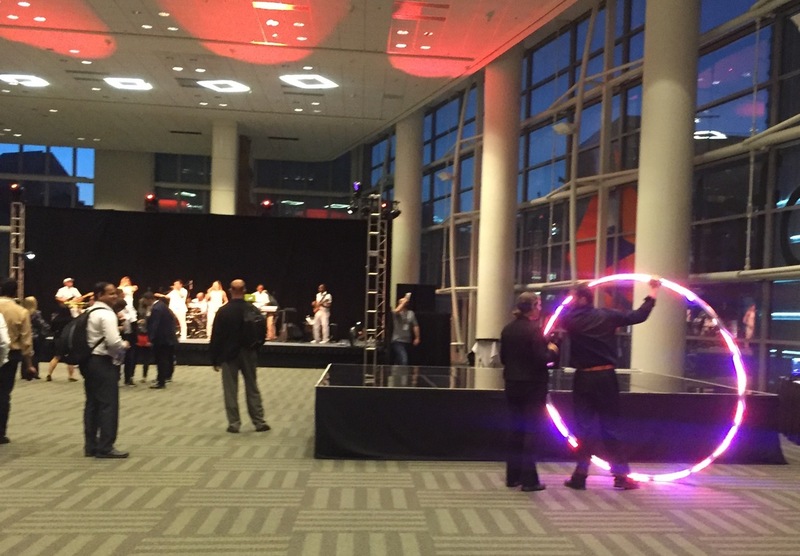 Between the two performers, we only had one poi reset itself during 2.5 hours of dancing, and one poi go offline during an update. Granted, I was trying hard not to whack them together, but little taps seemed not to hurt anything. Definitely a win. I’m working toward better robustness with the Supernova poi design, but they’re still pretty delicate and not-so-robust in the hands of beginner performers. 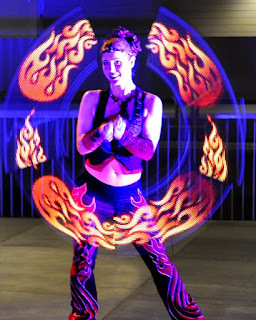 All told, I am going to stick with my Supernova poi for now, since my dance troupe regularly uses 3 sets synced together for our show and that’d cost me around $5,400 in Ignis poi. The Ignis poi definitely inspired me! I loved getting to perform with such a professional high end product.